Jerky is one of the oldest and most popular ways to preserve meat. Traditionally dried in sun and smoke, jerky can last through the winter and often longer if you make it properly. Although veggies, fruits, grains, seeds, and nuts are easier to store, preserving your own meat is quite doable. Home-made jerky is made in two steps. The first step is the marinade, which infuses flavors and various herbs, spices, and preserving agents (salt, and some of the spices) into the meat. The second step is the drying process that changes the environment to prevent bacteria from thriving. The end result is delicious preserved jerky, which can be used in a variety of ways and can be stored for months. Glass bowl, and/or shallow glass pan. Beef: Of course. It’s best to use a high-muscle low-fat cut. 1 cup wine, you can also substitute beer or soy sauce. Use what you have. 1 cup apple cider vinegar, you can substitute lemon juice. 2 tsp. sea salt, omit if you decide to use soy sauce. 1 head minced garlic, or at least 6 cloves. 2 tsp. spices, I used oregano and basil. You can use any standard garden spice (chives, parsley, turmeric, ginger, mint, rosemary…). Optional: If you want a spicy jerky, add 1/2 tsp. dried and ground chili peppers. Step 1 – Chill the roast while you prepare the marinade. Chilled meat is easier to cut, so pop the roast in the freezer and grab your glass bowl to start mixing the marinade. Step 2 – Add the wine and apple cider vinegar to the bowl first, then the sugar, and then all the other ingredients and spices. You’ll want to stir the marinade after every few additions. Note: Adding the sugar early makes sure that it dissolves thoroughly as you are mixing in the other ingredients. Step 3 – If you haven’t recently sharpened your knives, now would be a good time to do so. Sharp knives will make the preparation of the jerky much easier. Remember to wipe your knives off with a damp cloth after sharpening to prevent any micro-metal bits from getting into your food. Step 4 – Take you roast and carefully slice off all visible fat, and tendon sheathing (it’s the shiny white stuff that isn’t fat and is a pain to cut off). Fat will not dry properly, and can go rancid when exposed to air over time, removing all fat will help preserve your jerky. The tendon sheathing does not dry well, and is un-chewable when dried. Note: Trimmed fat can be rendered for tallow, fried as a treat for your pets, or tossed into a pot of soup for added flavour. Step 5 – Slice the roast into 1/4inch thick strips. You can do this either with the grain, or against it. I sliced mine against it, making the slices “end grain” on the roast. This is supposed to make the jerky a bit easier to chew compared to slicing with the grain. If you have awkward shaped chunks on your roast, there is one efficient way to include them in your jerky. Position your knife at the half-way point of your awkwardly shaped piece of meat. Slice mostly through the meat, leaving 1/4 inch unsliced. Turn the knife sidewise, and slice to the left (or right), cutting continuously about 1/4 inch thick. Turn the meat as you are cutting to turn the awkward shaped piece into a single strip of cut meat. Once that side is cut, repeat on the uncut side. Step 6 – Once all your meat is sliced, either drop it into the marinade, or spread it on a shallow glass pan and pour the marinade over it. Either way, get that sliced beef into the marinade. Cover with cling-wrap. Step 7 – Stick your marinating sliced beef into the refrigerator for 4-12 hours, or overnight. Step 8 – Once your jerky has marinated for 4-12 hours, place it on your dehydrator tray and let drip for a few minutes before putting in your dehydrator. Make sure that there is space for air circulation around each piece of jerky and that they are not overlapping. Set your dehydrator to around 155F and let dry for 8-16 hours. The meat will need to be turned after 3 hours, and trays may need to be shifted or turned around to ensure even drying. Jerky is dry when the meat breaks crisply, and has no moist or soft spots. Depending on how you cut the meat, some pieces may dry faster than to others. So check all the pieces, and don’t assume that because one slice is done, every slice is done. Step 9 – Once your jerky is dry, and has cooled from the dehydrator, you can package it up for storage. Store it in glass, to help prevent moisture buildup and flavor transfer, and keep it in a cool location (not in direct sunlight, or by a woodstove or radiator). Jerky can store indefinitely, but many people prefer using it up and replacing it within 3-6 months. Now, you may be asking, why is this section here? After all, it’s jerky. That means you just eat it! Well, technically yes. 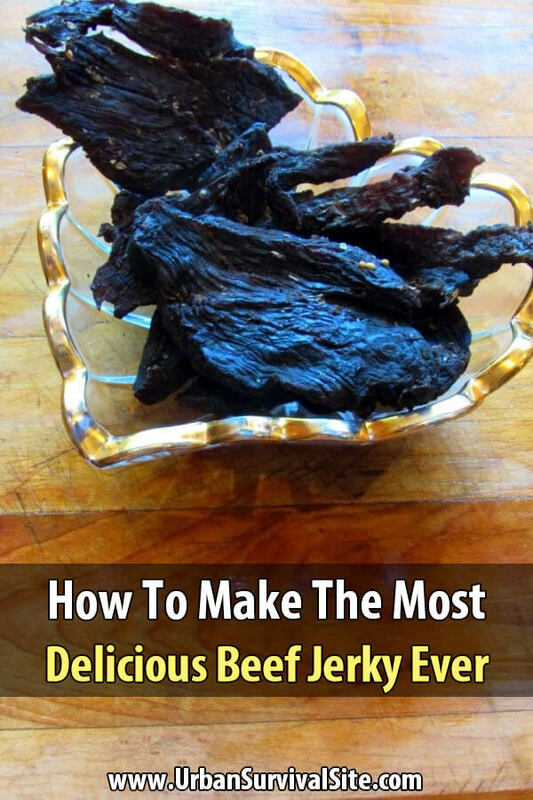 But, there is always more than one way to eat something, and jerky is no exception. Break up some highly spiced jerky, mix with dried vegetables and some dried pulses (peas, or lentils) for a dry soup mix. Store the soup mix in a jar in your cold room. Soup mix can work as a home-made convenience food. Soup mix is handy when camping, or as part of your emergency kit(s) to ensure a hot meal. Use beef jerky as high protein boost when doing intense activities such as hiking, mountain climbing, intense gardening, running, or even when you need an afternoon snack without the sugar crash. Pair your jerky with whole fruit or veggies for a quick, and filling, on-the-go lunch. Keep some jerky on-hand for your emergency kit. If storing the jerky in the kit, keep it in glass and replace every 3 months. There are two super easy ways to vary your jerky recipe. The first is by substituting a different meat. Venison, goat, lamb, or even turkey can all be jerked using the same marinade recipe. Just use the leanest meat that you can, and remember to slice it thinly. The second way to vary your jerky recipe is by changing up the spices you use in the marinade. So instead of paring basil and oregano, you could try a mint and rosemary variation, or a turmeric and ginger one for a more curry flavor. Alternatively, try varying the recipe to reflect what you have on-hand. Don’t have any beef roasts sitting around, but you do have a pile of goat shanks? Try turning the goat into jerky. Don’t have basil, but do have sage? Change up the spices and meat at the same time. Jerky is as interesting to make, as it is fun to eat. Just remember, that was a whole roast. So one probably shouldn’t eat the entire batch of jerky in one sitting. No matter how tasty, and tempting, that may be! Sarah Dalziel is passionate about skills, knowledge, and self-sufficiency. She was homeschooled K-BSc, and as a result enjoys questioning, researching, and writing about what she researches. Preparedness and Self-Sufficiency are two very fascinating topics, for her. The skills related to these topics are among the ones she considers the most fun and fascinating to learn and practice. Sarah is the inspiration behind WearingWoad.com, a natural dye blog, and also SarahDalzielMedia.com, an interdisciplinary skills and writing blog. I never see pork being used for jerky or pretty much every other meat preservation recipe. Can pork be used? I know some will say “You get worms!” but shouldn’t the heat in the dehydrator remove that worry? Is there a particular dehydrator that you would recommend? I have a small one that is good for fruit but I am not sure it would handle meat. There are lots of options, but I’ve had success using a Nesco Snackmaster. Yes, what you could do is set the oven to the lowest setting, keep it open several inches, and have a fan pointing toward it. The time will still be 8 to 16 hours and you’ll have to turn the meat occasionally and make sure it’s drying evenly. What is liquid smoke? Can it be substituted for anything? It is a dark liquid that gives food a kind of smokey taste, does not take much. And that is the product name Liquid Smoke. Not sure of a substitute, it is common in almost every store I have ever looked for it, but that has been in Texas an Oklahoma. You can make your own liquid smoke, however I have found it’s easier to buy it. Alton Brown showed how to make it in one of his Good Eats shows.